Lewis Trondheim has to be one of the funniest comic book writers out there right now and, as evidence to this statement, I present two books from the First Second publishing house – TINY TYRANT and KAPUT & ZOSKY. In both of these comic adventure collections, Trondheim (who is joined by illustrator Eric Cartier in KAPUT AND ZOSKY and illustrator Fabrice Parme in TINY TYRANT) packs each and every story with the nuttiest characters and plot devices that you, or your children, could dream up. Just the premise of these books is enough to tickle the funny bone. 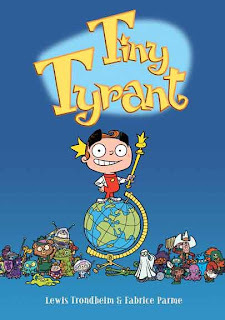 TINY TYRANT is about a 6-year-old kid named King Ethelbert who runs his own little island like a true spoiled brat who believes himself to be more powerful than he actually is. As a result, he gets his just rewards time and time again. His tantrums spark fear in his subjects, but they seem to know that this, too, will pass. After all, Ethelbert has the attention span of a little child and nothing stays in his focus for long. The comical tales include one where he discovers a cache of knock-off figurines of himself that were made in China. This discovery of contraband fascinates him (Ethelbert has a big ego for a little person and is thrilled to see the toys made in his image) but also gets his royal dander up, which leads to an outlandish detective investigation into the toy operation. In another tale, Ethelbert is so bored with other kids his age that he ships them all off to another country (after tossing aside his first idea to flush all the children down the toilet) and as a replacement, he has scores of robotic replicas of himself created for his island. He assumed they will be the perfect playmates, until he realizes just how annoying the robotic Ethelberts are. Unfortunately, this insight does not translate into Ethelbert reflecting on his own personality. The main characters in KAPUT & ZOSKY, meanwhile, are two purple aliens out to conquer and loot any planet they can find. They rarely accomplish this, thanks to the misadventures and roadblocks that Trondheim throws in their path. The book begins with a wonderful sequence in which the two alien invaders spy Earth from their spaceship, and declare it ripe for the picking. Upon landing on Earth, Kaput and Zosky, and the reader, realize something: our heroes are both smaller than a bug. They gulp at the sight of a spider and leave town as quick as possible. There is also the story in which they land on a planet that is a Democracy. Instead of using force, they decide the best way to take it over is to run for the office of President. They promise everything and anything, and get elected only to be run out of town when the residents start demanding accountability (providing a nice editorial on what it is like to be part of an election process). Interspersed between the stories of Kapot and Zosky are one-page comics called THE COSMONAUT. These wordless visual stories track the adventures of another hapless, but nameless, human space explorer who thinks nothing of taking a photograph of a new species, and the blasting it away, only to get his comeuppance at the end when he notices a alien taking his photograph. There is a wickedly delightful sense of humor that runs through both of these books by Trondheim that had me laughing out loud and anyone, regardless of age, would be well-served to get a good dose of either on any given day. The artwork neatly matches the frenetic storylines in both of these books. There is always more going on than meets the eye and gags and jokes abound everywhere you look. The artwork in TINY TYRANT is little more subdued. Illustrator Fabrice Parme uses empty space on the page to the story's advantage, and there are few clear-cut frames. This allows the story's visual humor to spill over from one sequence to another. And, to be honest, the Tiny Tyrant himself, Ethelbert, is such an incredibly cute kid, with a big grin and wide eyes, that it would be hard to dislike him, even as he is wreaking havoc on the world around him. This contrast between the art and personality works a certain magic on the reader. On the other hand, KAPUT & ZOSKY is packed to the hilt with funny drawings by Eric Cartier. It may be that aliens and strange planets drifting in unknown sectors of the Universe give the artist a bit more freedom, particularly when you consider the wide range of bizarre creatures that our two heroes meet along the way. Cartier is wise to give us contrasting main characters, too, with Kaput looking like a fat little punk rocker sporting a red mohawk and Zosky taking on the resemblance of a cerebral hot dog with hair. If that sounds odd to you that's because it is, and intentional, I'm sure. Both of these books could provide a launching pad for some potentially interesting creative writing. The TINY TYRANT certainly raises the question of what would students do if they were suddenly thrust into the role of ruling an entire island as royalty. What would their ideal island look like? And, if they were to be the queen or king, who would be the foil to their character (as Ethelbert has both a cousin who is king of a neighboring island and Princess Hildegardenia, who uses complicated words that confuse our boy king)? Who would give them tantrums and what would those tantrums look like? (Do we really want to know? Maybe we could just ask their parents). As for KAPUT & ZOSKY, well, who wouldn't like to live the carefree life of meandering through space, taking over a planet here and there, and going off on adventures? 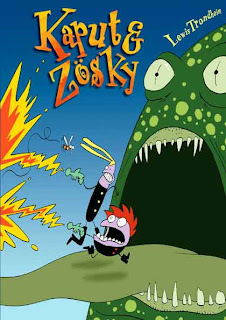 I think KAPUT & ZOSKY would be a good place for character development for students. Asking students to create two characters who complement each other and who feed off each other (and think of Abbott and Costello, or Laurel and Hardy, or maybe even Dr. Jekyll and Mr. Hyde) is a valuable exercise that forces the writer to map out the personality qualities and quirks of character creation. In addition, the story that I mentioned above concerning a planet built on Democracy might provide an interesting, and humorous, entry into the world of politics and the art of pandering and delivering on promises. I would rate this as a Highly Recommended for students in the elementary levels through high school, although my guess is that the cute covers might dissuade some older students from ever opening them up. Both books are fun adventures in which the characters get their full due for any transgressions of personality. For example, Kaput and Zosky periodically do blast the beings on the planets they stumble upon but there is nothing showing overt gore or violence. The victims just disappear into a puff of smoke. Most of the times, the two aliens apologize for their blasting, albeit to a cloud of vapor. And, like his counterparts in the other book, the Tiny Tyrant – King Ethelbert – never really ever causes much harm to anyone other than himself. There are some who might find KAPUT & ZOSKY mildly offensive, as the two aliens have very little concern for the populace or planet they are invading (except for the last story, in which they are mistaken for Cabbage Patch kids and nurtured by a motherly alien creature) and they often leave the visited world in shambles. (Which, come to think of it, is the story of colonization throughout history).